September is National Sewing Month! 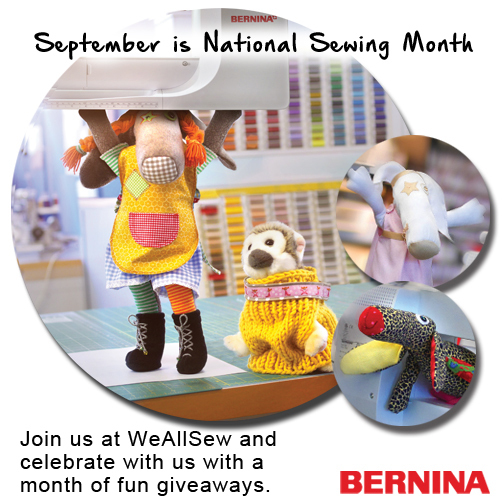 Join BERNINA at WeAllSew as we celebrate with a month of super sewing giveaways! Come visit us each Friday in September to join us in sharing our love of sewing while entering a random drawing to win a BERNINA backpack filled with sewing goodies. When did you first start to sew, and what was the first project you ever made? Sweepstakes Rules: Open to residents of the 50 United States and the District of Columbia. One comment per fan. Comment must be submitted to the WeAllSew.com blog by Thursday, September 4, 12:00 midnight Central Time. Winner will be chosen randomly. Winner will be notified by email and will have 48 hours to contact us at WeAllSew@berninausa.com to claim the prize; winner will be announced on WeAllSew about one week after contest ends. Congratulations to the winner of our first National Sewing Month contest, WeAllSew user 16suebee! 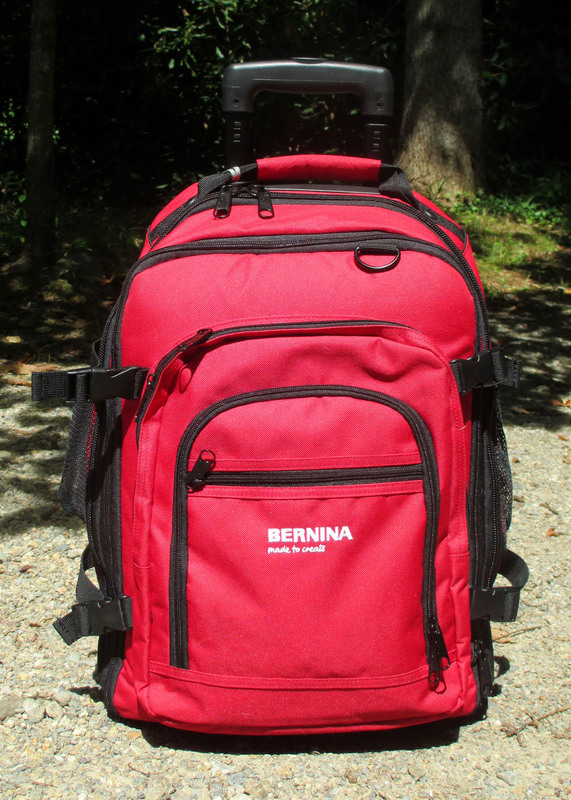 We hope you enjoy your new BERNINA back pack and sewing goodies, 16suebee, and happy sewing! Hair scrunchies in 5th grade, my dad showed me how to thread my mom’s machine, my grandma took me shopping for remnants and elastic and off I went!! Basically during summer between high school and college, to make a couple things to wear. Have almost ceased that so as to concentrate on quilts! A tote bag four years ago. My mother sent me for sewing lessons when I was 10. The first thing I made was a pair of flannel pajama pants for my older brother for Christmas. That was 25 years ago and he still has them!!! I really started to sew right after 9/11. It helped me to cope. I do not remember the first thing I sewed, although I am sure it was a quilt. I did embroidery when I was 6 or 7 and now I do it with my 830! I think I was about eight or ten (a *long* time ago!) when I made a costume for my Barbie doll as a school project. Before that, I hadn’t really sewn anything by myself, but I’d done a little simple seaming with supervision. I was 12 years old when I started to sew. My first project was a book cover for my friend for a Xmas present,she loved it! The first project I remember was a bib apron in seventh-grade home ec class, but I probably made doll clothes by hand before that. I learned to sew about 50 years ago when I was 10 years old. I made a very simple apron my mother taught me. I started making doll clothes and aprons when I was about 7. My mom had a White sewing machine (electric) and I never ran a needle thru my finger until I was grown. I still have my dolls & the clothes I made. I remember when I was about seven I cut out a dog pattern and began sewing it. I had watched my mom sew. When I was done sewing the first piece I took it out to my mom and asked how to get the pattern piece off! I had thought I had to follow along the stitching line on the pattern — otherwise how would I know where to sew? I don’t know if I ever finished the dog. I sewed with my grandmother when I was tiny, but the first thing I can remember sewing is a scrunchie. First bigger project was either a shirt or a plastic bag holder- that my mom still uses! As a little girl (3 or so), I had a toy sewing machine that worked. Learned how to mend clothes. I remember making doll clothes for Barbie. I started with my great-grandmother teaching me to sew squares together by hand but didn’t really learn to sew until I was 30. About 15 years ago. I made a quilt for my son. He still has it. Home Ec class when I was 12. I made a sleeveless cotton blouse, and my grandmother made a yellow corduroy skirt for me so I could wear it to school. I started by making clothes for my dolls. I can’t explain why, but I just knew how to sew. I guess this is how some athletes are. I’ve sewn as long as I can remember, helping my mom. My first real project in home economics was in Jr high in the ’70’s, corduroy pants with a matching vest lined with scraps my mom had around the house from making my bridesmaid dress for a friend of the family. I was 25 and took a lingerie class to learn how to sew. The first thing I ever made was a camisole. A little red and white skirt was my first sewing project at age 10 with my Mom ! I grew up watching my mom sew and she made she I took home economics. My first independent project was in the 6th grade. I made a lap blanket (6th grade size). I picked out my own fabric and had the right of passage of purchasing on my own. I still remember the old shop that is long gone and the smell of newly oiled singer machines lining the wall. 25 years later I still get the thrill of a new project and love the smell of the fabric store. I started sewing as a toddler with my Grandmother on her treadle machine. I worked the peddles and helped sort the pieces for her. She was an awesome quilter. That was so long ago I won’t begin to tell you how many years but I wish I had that machine. I did a lot of handstitching, mostly cross-stitch when I was younger, but then when I had my daughters I really wanted to learn to sew clothing to make them matching outfits.So, I called my mom and she would help me over the phone. She always loved to sew and was thrilled that I finally did too! Now I can’t hardly go a day without a little stitching of some kind! 🙂 Thanks for the chance and Happy Sewing Month!!! I learned to sew when I was 24 and pregnant with my first daughter. My first project was burpcloths! I got my first sewing machine for my 14th birthday and I pieced a Dutch doll quilt top with my grandmothers help. When I was very young – so I’m guessing doll clothes. When I was really little I begged my mom to let me make something, I made a mini heat shaped pillow out of spare red corduroy she had used to make me overalls. Years ago I made toddler pants for my son from a pattern. But recently I started quilting and made a welcome quilt for my entryway. I first started to see when I was about 10. The project was an apron. I think I may still have it some 49 years later. I first learned to sew on a machine when I was four years old. I made a new pillow case for the one that I ripped during a pillow fight! There were feathers everywhere and my mom was not pleased. She taught me to sew so I could repair the damage I’d done. I still remember the blue and white ticking that I used. It was the summer before I entered seventh grade and I made a sleeveless blouse from a pattern. My first project was a corduroy jumper that I made in Home Ec class in the 7th grade. Thanks for the chance to win! I made a babydoll top at age 20. My earliest sewing memories are from about age 9 with my great grandmother. She worked the foot pedal while I guided the pillow fabric on her antique sewing machine. When I started high school we made our smocks for our cooking class in our sewing class. In primary school we did a lot samples of various stiches. I come from a family of sewists, but I learned the art in junior high school at the age of 12. My first project was an apron that I still have (and I’m in my 50’s!). After that, I was hooked and have sewn ever since. It’s fun to create! I first sewed in Home Ec in middle school. I can’t remember my first project, but I remember sewing an a-line skirt. I learned to sew last October 2013….started and finished a quilt the first day I had my new Bernina 330. I was hooked! Since then, I have made about 2 quilts every month and have made several other projects as well. If I didn’t let my sister drag me into the Bernina dealership with her that day, I would have never known how much of a love I had for sewing. Also, the Bernina Sales Rep. was incredibly helpful and taught me to sew before I left the store with my new machine that same day. I think it was sixth grade. I made a smock top with a ruffled sleeve. I started to sew at 15. My first project was a dress. Eighth grade, pillow cases with embroidery! I first learned to sew in Home Economics class. I made a skirt. I now enjoy quilting. I was nine years old and completed a 4-H project, an apron. I took home economics in high school and made a skirt with an elastic waistband. Been sewing ever since, 40 years. I would say 2008ish. Made curtains for my living room. I must have been about 8 years old, my great-aunt always sewed my clothing, and I wanted to learn. She had me make a pillow with ruffles and all. It did come out a bit lopsided but I fell in love with sewing from that pillow on! I began sewing at around 10 years old. My mom taught me. My first project was a book tote. Started my sewing classes when I was about 11 years old. It was in the hall of a church in my town where I lived. Don’t remember what was the first thing I made but I do remember having all my “tools” in a fishing tackle box which I decorated with stickers. First complete project was a pair of “Babydoll Pajamas” 50+ years ago. I’ve sewn a lot of things since then…Business suits, wedding dresses, lots of thing for infants and kids and at one time just about everything that was in my closet. I have just started making quilts and Love It! Love It! Love It!. Am just finishing a wedding quilt for my grand daughter and will be onto the next project. What ever goodies there are in that Bernina backpack would sure be put to good use. I learned at the age of 7 or 8 from my mother on a Singer treadle which she had converted eventually and have been sewing ever since some 70 years later but on a Bernina – yay! I am an avid art quilter. Age 12 from our moms and we made shorts. I first learned to sew from my Mother. I was in 5th grade. When I was about 4 years old I got the Measles. During my illness, my Grandmother made me a quilt. I felt so special as we had a very large family and being the youngest, I never receive anything that wasn’t brand new! Well, new to me! The quilt was made from her old dresses.i wore that quilt out all tattered and torn. When I was in 5th grade I wanted to make my own quilt . My mother had a Singer . She wanted me to make something more simple like a pillow, but I was determined to make a quilt! She didn’t have the money for material, so I got out my play clothes and used the the warn shirts. We cut squares together, laid them on the floor, organized a pattern and sewn them in chains! We tied the corners with red yarn bound it Al together. She would spend an hour with me every night after dinner, working on my quilt with me as long as I did my homework!! I miss those days with Mama. She had twelve children and managed to find time for us all! In the seventh grade we all made gym bags. I was hooked on sewing. I think I started sewing when I was 10 making clothes for my dolls with the help of my mom. Now I love sewing all kinds of things and meet with friends once a month to sew. We all learn from each other and have so much fun! I have always been around the sewing machine. My grandmother and mom have always sewed, but my first project was doll clothes when I was 6….I had lots of help from my grandmother, but that began my love. I just started seriously sewing last year right before I turned 40. However, when I took Home Ec in middle school there was a sewing segment. My first sewing project was a pencil shaped pillow. My mom loves to see, and she is so happy that I have finally picked up her passion for it! Now I see all the time! I was in Home Ec (wow, that dates me) and I had to make an apron. I picked the most hideous orange fabric. now I wish I stil had that silly apron. I started to sew just two years ago and the first thing made was an apron that I still use in the kitchen today. In Jr high school, I made a most hideous pair of pants. Those old fashioned pull on pairs with thick elastic . I was in grade school–probably 5th grade. My dad taught me to use a treadle sewing machine. My grandmother showed me how to sew and the first thing I made was a simple doll dress. Taught myself to sew about when 11 years old so I could make matching skirts for my best friend and me!!! 7th grade..taught myself before we were required to do sewing. Made a Jessica McClintock prairie-style dress which were all the rage in the early 80’s. My home-ec teacher didn’t believe I made it myself. I began in middle school. I was in 4-H and remember making a number of items including an apron and an embroidered tea towel. I still have that apron and use it in my sewing room! I’m so glad that we had Home Ec in school. I started to see in Home EC with Mrs Davis in seventh grade. My first project was a tweed jumper. I continued to teach myself until I got my Bernina and actually learned so much in the classes offered. I started sewing when I was in high school. I made an apron. I didn’t sew for many years until my children were small and made their clothes and started quilting and have been ever since. My first sewing was a pin cushion 57 years ago and I still have it and the sewing basket! I began watching my grandmothers and mother sew when I was just five or six years old. I bought my first sewing machine in summer of 1968 and a good friend uses it and I’ve progressed to bigger machines and also to using a serger. It was a set of baby doll pj’s in Home Ec, 7th grade. I think it was made from flannel. They would only give you about 10 minutes 2x’s a week to sew on it, and you could not take it home. Can’t remember if it ever got finished. Don’t think I ever wore them! I was 10 and at my Grandmothers for the summer. I made a pair of shorts from a pattern she drew out on a brown paper bag. I started sewing when I was in junior high school in the 60’s. My mother and grandmother both sewed, so I learned from both of them and we made most of our own clothes. I remember making a dress in home economics class. My mother and grandmothers ALWAYS sewed, but my first project was a simple A-line dress…took sewing lessons with our 4-H club. I wore the dress constantly, but honestly…I didn’t enjoy sewing at all. Surprised to find that after 40 years I actually DO enjoy it, but my Mom is shocked because she figured I was a lost cause. I don’t remember my age but probably was around third grade. I made pillows out of washcloths with pom pom fringe around the edges. Used cut up stockings for stuffing. My mom taught me to sew when I was in 1st grade. I made a blouse. And I have been sewing every since. In 2005 I stopped in a Bernina store to find out about the machines before I headed to WalMart to buy my first machine! Needless to say I bought my bernina and took a class….sewed a placemat …..! Used my first Bernina for almost a year, learned how to quilt, upgraded to a 440QE…..and never looked back! Now I teach quilting and love sewing on my Bernina everyday! I was 9 years old.. the summer of 1966. My first sewing project was a pillow case, which I still have and sometimes still use. It is a blue and white cotton print. It is so soft from so many washing’s. I think I was about 11 years old when I started to sew. The first thing I made was a stuffed frog that I altered the pattern on. I made an open mouth with a long tongue, complete with a bug sewn to the end of it! I remember learning to sew doll clothes using my mother’s treadle sewing machine before REA came to the farm in the early 50’s. I must have been about 4 years old. My mother, all her sisters and grandmother all sewed making most of their family’s everyday clothing. In high school home ec., I learned more about sewing techniques making most of my own clothes by the time I graduated high school. I started helping my grandmother cut hexes and matching up colors for her Flower Garden Quilts when I was 5 or 6. But I actually got to use the sewing machine with my mom about 50 years ago when I was 10. We sewed clothes for me, but I can’t remember the very first thing I made – it was quite a while ago! I was nine and was taught the blanket stitch using embroidery floss, sewing around the edge of felt cut out shapes for Christmas ornaments. I was late to sewing, my whole family on my father’s side were professional sewers. My grandmother taught my mother to sew but since my grandmother couldn’t read English she taught her by looking at the pictures. When I expressed an interest in sewing my mother told me to wait till I could take it in school and learn the right way to sew. So in my junior year of high school I took sewing. Can’t say that the teacher was much better than learning from my grandmother, there were a lot of gaps in what she taught us. So I left sewing for a while and didn’t pick it up till after my son was born, and was sorry that I waited so long. Love to sew. I made an elastic waist skirt in junior high school. I started sewing just after I got married. My first completed project was a maternity dress. I was in 4-H and made an apron. It was red and I remember the judge said it would show flour too much. So I think I received a red ribbon on it. My Granny taught me to sew when I was 5 (54 years ago). I helped make quilts and that started my love for sewing. When I was in the 4th and 5th grade I won first place ribbons for sewing. I made a dress in the 4th grade and a culotte outfit (1 piece) with a zipper in the 5th. I never had a really good machine but I’ve made clothes for myself, my children, and now my grandchildren. The passion is still there. I have an outfit cu out for a granddaughter and badges to sew on for a police officer grown child. I started to sew way back when I was about 7 years old on my Mother’s old Sears Kenmore sewing machine. The first thing I made on my own was a dress from a pattern. The hem was a little crooked, but everyone at church just OOHed and AWEed over it, because Mom had told them all beforehand. THAT got me excited about sewing and I’ve been sewing ever since! 56 years ago. I had spent many hours watching Momma. Daddy stayed home one Sunday night with me and my three brothers so she could go to church in peace. As soon as she left, I attempted to sew several scraps together to make myself a cape. She kept it for years. I don’t know what happened to it but I have continued to sew these past 56 years. I learned to sew whenI was around 12 and it was a skirt. I was 10 years old and in 4-H. My first project was a red fringed table covering. I still use it at Christmas every year! I took Home Ec in high school in the early 60’s. The first thing I made was a black skirt and vest. My sister-in-law, Annette, taught me to sew when I wash round 10. That was 37 years ago. I think I made a tank top. I started sewing with my mom and grandmother at about the time I started school. My first projects were hand sewn doll clothes, Soon I “graduated” to the treadle machine, Before Long I will be the owner of that machine, and I will use it again!!!!!!! In 6th grade, we could take home ec. Our first project was an apron with a bib. I was 12. My grandmother had a pedal singer that I learned to sew with. It was 1965 ,and I made a hooded cape for halloween. 2 years ago–apron in sewing class at the store I bought my Bernina sewing machine from. The first project I remember making was an apron when I was in Camp Fire Girls. That would have been when I was in 3rd or 4th grade. By 1964 I was sewing before entering Jr. High. My mother and sisters taught me. The first thing I made on my own was a wrist pin cushion. I remember being so bored in Home Ec, that I went around the room helping to teach the other girls how to sew. I wanted to make something big, not just another little old wrist pin cushion. I was 5 years old and learned on my great-aunt’s treadle machine. First thing I made was a dress for my doll. My mother was my sewing teacher in grade school, I must have been 7 or 8. We made a stuffed teddy bear, with hand sewn blanket stich around the edges. Still have it somewhere. I made a jumper for Jr. High Home Economics. My mom sewed for me till I was married at 22. Then I took a sewing class because basically I had learned everything but running the machine anyway. I picked a nice straight, no waist business style dress with a zipper in the back and small peter pan type collar. It was deceptively hard. I thought without a waistband it looked simple but I got to learn how to set in a zipper, long set in sleeves, collar and kick pleat. It has had a long tuck on each side from shoulder to hem. With the guidance of a really good teacher it turned out spectacular. All that was almost 30 years ago! I didn’t take Home Economics class because I went down the business track and took Shorthand, Business Machines, Book keeping etc. LOL. I ended up sewing anyway and now of course…I’m teaching! High school freshman home economics class. I made an awful pair of pants and top that we had to wear to school one day. Never wore it again. I was ten. In Brooklyn, Singer had a teaching section downtown. Learned the basics, but didn’t really sew until high school. As a young mother I started sewing for my children. I took a “Stretch N Sew” class and just kept learning from there. Well, I cannot count trying to learn to sew in high school, because I did NOT learn 🙂 So really it was 2002. My Aunt Di taught me how to make a Quilt in a Day Log Cabin Pattern. I spent ALL DAY in her sewing room making that 4 block quilt but I did it and I was hooked from then on! I was 4 years old. Mom taught me how to have the best looking blankets on all my toy horses and the best dressed dollies! I was about 8 years old when my mother started teaching me to sew. I joined 4 H and my first sewing project was a table cloth and 4 napkins to match. Up until a few years ago I still had that set but in one of my last moves I donated it to Goodwill…. I learned how to sew by hand the summer I turned nine. I made a small pouch for hair elastics and scruchies. I took two sewing lessons in 2010. I made a pocket tissue holder. I finally got off (or is it on, in this case?) my duff in June 2013 and learned how to navigate a sewing machine. I made myself a skirt. My first sewing project was in Home-Economics. I was in 9th grade and was not one of the teacher’s pets as she had a few. We had to make a dress. I made a brown colored shift. I could get into it without using the zipper. It was a total disaster. I didn’t sew again for many years. I learned how to make a green skirt in junior high which I hated the color of. I made a dress that I loved. My mom put that dress, along with other clean laundry, on the bed in the room my sister and I shared. My younger brother and his friend came into our room and plugged in my mother’s electric scissors and the dress and other clothes were history. Boy did they get in trouble. We laugh about it now. I started sewing in college, and made folk dancing costumes. Home Ec class… A sleeveless top with facings… Not sure I ever finished it! I was perhaps 10.
i learned to sew as a little girl by watching my mother. one of the first projects i made was doll clothes, and i made a dress out of mattress material my mother had from working in a mattress factory. I was 12 in 7th grade Home Ec class. We made aprons with bibs. Mine had pink roses. My mom always sewed but it wasn’t until after that class she let me use her sewing machine. I think the first thing I sewed on a machine was in 7th grade Home Ec. I think it was a bag bag (for storing plastic bags inside). We had to do a painted stencil on the outside. It was *super* ugly! I took it home and my mom said she would teach me! It was winter of 1988, I jumped a fence to get away from a mean nasty dog and ripped my school uniform skirt. I got home and pulled out my mom’s sewing machine and fixed it. Mom worked late she never knew. I now own several machines and have taught my daughter how to sew just in case she is in a pinch. I learned how to sew in August of last year. My first completed project was a reversible superhero cape for my toddler son. Have made him several pj pants since, several purses with matching zipper pouches, home decor items, almost done with my first quilt and making his Halloween costume! I love my new craft!! I was 6 and used scraps from my Mother’s sewing and a hand needle t make my doll a skirt. Just turning 65 so it was a LONG time ago!! Remember sewing for my Ginny dolls and making blankets to sell at the church bazaar when I was maybe 10!! Mom taught me. My best friend’s mother taught us the summer we were 11 or 12. Although I do not remember the project, it sure inspired me. 45 years later I now teach sewing to children 8 years old and older. When I have my first child 5 years ago. I made his first Halloween costume. He was the Pillsbury doughboy. Since then I haven’t stop sewing. Started sewing at the age of 9. My first project was a doll dress. Started sewing when I was about 5. Dresses for my doll. I really consider my self starting to sew in 2011 when I got my first bernina! Made a quilt and tee shirts that week! In the late 80’s. I went to a couture school and learned slopers. Our first project was skirts. What an idiot to start sewing at a couture school. I did learn good habits there, though. I think that you learned slopers early on is great! I took private classes to learn a basic dress and pants sloper after having sewn for three years or so and it was an eye-opener. It was like the difference between driving a car and being able to tune it! Perhaps you could have gained that knowledge elsewhere but on the other hand, how many of us get to learn the theory of slopers, drape, etc.? And how awesome to have a background that can free you from the chains of mass-produced paper patterns? Anyway, congrats on your sewing learning, however you came by it. Cheers! I cannot remember not sewing. Our mother taught all 7 of her daughters to sew. We started with small projects – even helping when Mom was making clothes for the family. Started sewing in high school in home economics, but didn’t like it. Then when I got married, I started sewing for my kids. I even learned to make a cabbage patch doll. My kids wouldn’t wear home made clothes, so I didn’t sew for over 20 years, then I started sewing quilts. Now I sew quilts and my husband hand quilts them. I have made at least 15 quilts in the last 4 years. I am 70 years old. At age 13, I had to make an A-line skirt for Home Economics. My grandma thought me how to sew when I was 9 years old. I used some of her scrap fabrics to make 5 small rice bags to play a game that was popular in my birth country (Brazil) in the late 70s early 80s called “saquinho” . I started sew my making clothes for my German Shepard at age 7. Mother looking over my shoulder, of course. My first clothing item for me was a skirt in junior high. My grandmother was my hometown’s local seamstress and tailor. She made all of the high school’s band uniforms, majorette costumes, halloween costumes, and did everyone’s alterations. I spent most of my time with her as a small child and one of my earliest memories is sequins all over the floor that would stick to my bare feet. She started teaching me to sew very early and my first project from start to finish was a pair of flared pants from one of her vintage early 1970s patterns…I chose wild rainbow printed fabric to fit the groovy 60s/70s theme and wore them to my school’s 60s day during Homecoming week during middle school. I first learned to sew on my great grandmother’s treadle sewing machine when I could barely reach the peddle. The first project I remember making, however, was a couple years later. I made a red wrap skirt when I was ten. I made doll pillows at 7. Sewing ever since. I was 9 years old (decades ago!) and made a purple Hawaiian print shift dress for myself. I think I started with an apron in 7th grade Home Ec–which I don’t remember at all. It was followed though by a simple A-line skirt that I loved (and wore) to death. The experience of being able to choose my own fabrics/colors for something I would wear made a big impression. I started sewing when I was six…74 years ago. I made doll clothes for my Raggedy Ann by hand because my mother wouldn’t let me use her Singer. She did let me use it as I got older and I made clothes for myself and still do only now on a Bernina. I think I was 9. Made a sleeveless A-line dress. I still have it somewhere. My best friend belonged to 4H so when I was old enough, 9 yrs old I think, I joined also. I can picture the first thing I made, an apron. It was forest green with a small print. That was the beginning of my love of sewing and all things associated with it. I have been sewing for 55 years and don’t ever plan to stop. I started sewing a few years ago making dog collars and dog beds for my foster dogs. Started sewing about 7th grade and my Mom took over from there showing me. My first project was a beach bag. Thanks for the chance. In the seventh grade I made a velvet hippo stuffed animal…for a geography class, and we walked across the stage to show off our creation. I have been creating ever since. My grandmother took me to the fabric store to get the supplies and we worked together, the hippo was awkward and squishy but I was so extremely proud of him. Dark Green with a white lace collar…I want this pattern for the dog featured here. This dog reminds me of that project and I want to make a few in all different fabrics. Thanks for giving us a chance to win this back pack, would so come in handy when traveling to brooklyn to visit my son, could take projects on the train. So excited to win this prize. thank you, thank you, thank you, I went searching for hours for this pattern and could not figure out where it was located…but I knew with the way they advertise this little guy it was OUT THERE, somewhere…I am starting immediately on this…and can not believe I’ve found it. Fell in love with this little guy the second I saw him. I think I was 5 or 6 when I learned to hand embroider and run the treadle from my dear Grandmother. We made many pillow cases and tea towels and of course 90% of our clothing. Made a stuffed frog age 11. Sewed in middle school, made some clothes then not again till I had children, then just Halloween costumes. Three years ago started quilting and bought a 750, love it. My mother sewed from the time she was a girl in Colombia until I was in grade school. She sewed on a Pfaff with dozens of cams for decorative stitching. She largely abandoned machine sewing for lack of time raising me alone while also working full-time. After I married and had my first child, I spotted a sewing magazine and remembered my mom’s old sewing talents. The sewing legacy began with my grandmother who taught herself to sew in order to supplement the family income and to save money on clothing for her large family. I did not take home economics in high school so when the sewing bug bit, I went to a night school home sewing class to learn the basics. My first machine was a 19 pound Singer machine named “Genie” (which is also my nickname). After a couple years of sewing, my husband researched and selected a Bernina 830 machine which he gave me for Christmas in 1975. (The marriage did not last, but the Bernina did!) That is *still* my machine, which I love. I sewed actively from 1975 until 1996. I am returning to sewing with a lot of gratitude to be able to sew for me, for my home and for family and friends. Working in IT for a living, I genuinely enjoy using a machine rather than a computer. Even so, my local Bernina dealer keeps tempting me with the features of the new machines. My first sewing project was a patchwork quilt for my American Girl Doll. I was 8 years old and my grandmother taught me the basics of strip quilting. I’ve loved to sew ever since. First started making Barbie doll clothes around seven, than I did a skirt in 4-H. I was 7 or 8 when I played with mymother’s sewing machine and stitches pieces of cloth together. I used my grandmother’s treadle machine in the summers. When I was 11 or 12 while my mother was visiting her family I got into her stash and used a piece of plaid cotton to make my 4 year old sister a dress. I didn’t know what I was doing but I stared at the instruction sheet until I figured it out. I knew about matching plaids by watching my mother cut out patterns. The dress had a citted bodice with a peter pan collar and puffed sleeves with a band at the bottom. The skirt was gored and there were ties for the sash. If that wasn’t enough, There was a round yoke (like you see on a lot of nightgowns) and a scallop trim around the bottom of the yoke. I had to stitch the edge of the scallops, trim, and turn and place over the bodice before attaching the yoke. I wish my mother would have kept this dress. I would like to see what kind of work a real beginner did. Now 63 years later I’m still sewing. My first project was a denim jacket. A blouse when I was 29 yrs. old. I sewed once in high school – made a jumper…then not for the next 40 yrs…started quilting a year and a half ago! LOL! I was seven or eight, had a “toy” sewing machine, and I made costumes for a pair of hand puppets. I started sewing when I was 12 years old. I had received my first sewing book from a great aunt and in turn I decided to make my first doll. my mother had scraps of material so I hand sewed the doll together and embellished it with odds and ends from around the house. I was five or six and made a pillowcase. Now my son uses that threadbare piece for his pillowcase. Age 3! My mom was taking sewing classes and I was an only child. So I did everything she did. I made a doll blanket while she made a dress. I don’t remember how old I was (let’s just say it was a LONG time ago:-), but the first thing I remember making is a potholder. The first sewing project I can remember is an apron for 4-H when I was about 7. My mom helped me but made sure I did all the sewing! I got a sewing machine as a wedding present and played with it some but my first project was actually a gift for my grandparent’s fiftieth anniversary. I made them a 50 square quilt with an embroidered poem panel in the center. Each of the squares around it represented a year and was hand embroidered with an event (like a handprint and name of a grandchild). We were far away from family at the time so each family member sent me a paper of what they wanted embroidered on it. It was tricky to learn by myself and I seriously doubt if any one square was actually square but it has become a family heirloom now. It’s still my most favorite sewing memory. The post says to return every Friday, but I see this week’s contest was closed on Thursday. What gives? My first project was an apron in 7th grade Home Economics. In 8th grade, the teacher let us make anything we wanted. I chose a pattern for a suit with a lined jacket and a box-pleated skirt! I can hardly believe now that I actually made it. The seams were crooked and the zipper left a lot to be desired. My family was very poor. Until I learned to sew, I dressed from clothes in the “give-away box” of clothes in the church basement. I took to sewing like a duck to water, because it was a way I could get some better clothes to wear to school. It all turned out for the best. I have really enjoyed sewing through the years. I sew for pleasure now (not necessity) on my amazing 830. My first project was a small quilt that my next door neighbor helped me with. That was over 20 years ago and I have not stopped quilting since then. I own three Bernina’s and love every one of them. I have talked all of my friends into becoming owners also. I try to sew a litlle every day. I learned to sew in Home Ec in 7th grade and I remember a fitted dress with sleeves which was quite the headache. a quilt top, age 7, my Grandma taught me sewing on her machine. From then on I made all my clothes. Still love sewing today. My first sewing project was a skort for 4H. My mother was very patient in trying to teach me all the correct techniques. I wore this skort often and was very proud that I made it myself. I made an apron in a schools sewing class age 9. Both boys and girls had to do sewing, knitting, wood work and metalwork. I liked them all, but realy took to working with fabric! For long enough after that I would make dolly clothes, making it all up as I went along. Then one summer ( around age 14) took sewing lessons with a teacher that put me right off. I still wanted to quilt though and have been a fairly competent one for almost 10 years now. The “teacher”, however, did a really good job of discouraging me and even putting on a button makes my teeth ache! I was probably about 7 years old. I believe the first project was pincushions in the shape of a cat’s face as Christmas presents. My very first project was when i was about 10 years old. i remember my mother helping to setup this old portable sewing machine that came in a brown case with latches on each end to uncover. Looking back i don’t know what i was thinking in making my first project be Barbie clothes. Everything was so small and i don’t think i would willingly do it now. From there my sewing has evolved from sewing my own clothes through school, my daughters clothes as she was growing up and now quilting. From the time i was married my only machines have been Bernina’s and i couldn’t be happier. Did hand sewing when I was about 10 making barbie clothes and felt christmas ornaments. Machine sewing in 7th grade home-ec class, made a poncho. I started sewing in 2002, when I was diagnosed with breast cancer, sewing was my salvation, I did a quilt and since them I continue quilting, is my passion. My nana owned and managed a fabric store when I was in grade school. We sewed together whenever we had the chance. I don’t remember my first project but I do know that by the time I took a home ec class in junior high school and made a poncho it was an easy task. When my daughter was ready to start Kindergarten she needed clothes. So I bought a pattern, a piece of fabric, and step-by-step learned to sew her a little jumper – and I’ve been sewing steadily ever since. My very first project was a doll blanket stitched when I was about 4 years old. I took home ec and learned to use a sewing machine in 7th grade but was NEVER allowed to touch my mother’s Kenmore sewing machine! My first quilt was made about 15 years ago and I’ve been quilting ever since. My grandmother was a seamstress by trade, about age 10 she taught me how to make simple doll clothes, blankets, pillows and cases for my doll’s crib. What memories! I first started to sew at the age of 12. I had received a basic sewing book from my great aunt and inside was what I thought was a cute doll. I used scraps of fabric my mother had and whatever embellishments I could find in the house to finish the doll after I had hand sewn the pieces of fabric together. I was soooo proud of my accomplishment. I first started sewing in 7th grade, & made an apron. I sewed on & off over the years, until I had to stop working due to health reasons, about 15 years ago. I have been an avid quilter ever since. WHERE CAN I BUY THE PATTERN FOR THE PUPPIES ON THIS POST? THEY ARE ADORABLE!!!!! I started sewing February, 2013. The first thing I made was an iPad cover. I wanted to learn how to make quilts. I purchased a special edition 350, and love sewing! I’m looking forward to upgrading in a year or two to an 8-series. I was probably 8 or 9 and made clothes for my Troll dolls. So much fun using scraps from my mom and gramma’s sewing projects, hand sewing leftover buttons and bits of trim onto my creations. I came by the love of fabric naturally and now I’m full on into quilting!